Although it’s one of the cornerstones of an organized home, I’m amazed how many folks haven’t heard of the “landing strip”. The concept it very simple. Organization comes from things having a place and being in their place and probably the time when this rule is least observed is when we come home. We arrive from work exhausted, often carrying our work bags, groceries, and the mail. All we can think of is changing into jeans and slippers. We just toss down our things and later we’re too preoccupied to tidy up. If instead you have a place to “land,” and a routine for doing so, you’ll avoid disorganization. A landing strip in your home should be at the entrance you use most often. The idea is that when you come in, you stop here first and unload. 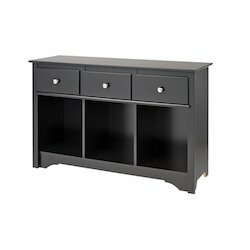 A small table, sideboard, or credenza will do. Your landing strip should have a designated place for everything, so when you come in all you have to do is put everything in its place. I like to use a large unbreakable bowl for my wallet, keys, cell phone, and watch. On my way out again, I know exactly where I’ll find them — no wasting time hunting for my keys. Hooks on the wall or on the side of the furniture are great for bags — just drop your bag on the hook and keep going. An inbox or mail holder is also a must. When you come in with mail, you’ll have a place to put it. Don’t bother sorting through it. Anything that needs your immediate attention would have come certified, so wait until you have time to process it properly. Once a week, grab a cup of coffee and go through all the mail, tossing out the junk mail and paying bills right then and there. By batching the mail sorting to once a week, you save time and you reduce the stress that comes from feeling like you have to address each piece of mail. Nunc is the Latin word for now. You would think, with an item that looked exactly like a watch, you would be able to use it to tell you what time it is now. 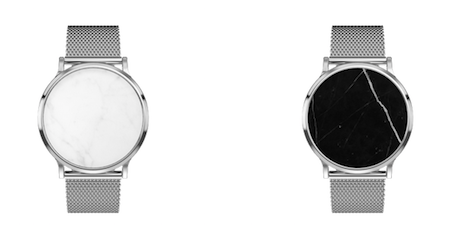 The Nunc watch is created with high-grade stainless steel and encases a one-of-a-kind, marble stone that supposedly represents the uniqueness of every moment. The wooden box in which the watch is shipped, transforms into a plant pot. Their artisanal manufacturing processes (as shown by their use of electrical power tools) compliments their philosophy of environmentalism. To further reduce their carbon footprint, they also source their materials close to their manufacturing site (which is interesting because they ship anywhere in the world in 2-6 business days. I’m pretty sure you can’t walk, cycle, or swim from Italy to North America in that time-frame). The Nunc watch is not a watch. It is jewelry that you wear around your wrist to remind you to live life to the fullest. We should create a special name for this item! How about the word bracelet? We could even invent bracelets that already have inspirational sayings on them so you wouldn’t need to think of your own as you looked at your blank, €160, piece of marble encased in stainless steel. 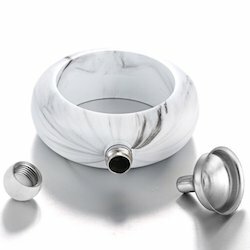 If I were to buy a stainless steel and marble bracelet, I’d choose this one because it serves two purposes, some single malt whisky and living life to the fullest. 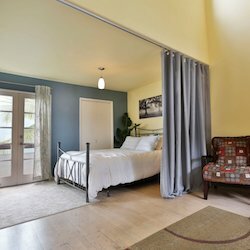 If you have a small guest bedroom in which you host friends and family, storage for your guests’ clothing may be an issue if they are staying for an extended period of time. Rather than have a dresser that takes up so much space and hardly ever gets used, hang a 6-Shelf Canvas Sweater Organizer in the closet. The shelves have ample storage space for the shirts, sweaters, and trousers a guest might bring with them. 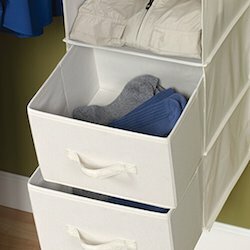 Consider adding a couple of matching drawers to the hanging organizer. It will help keep your guests’ smaller items (i.e. socks and underwear) tidy. The bonus part of this system is that when it is not being used it collapses down into a fraction of its size for easy storage. Now that you’ve taken the quiz to determine if you are a visual, auditory, or kinesthetic/tactile acquirer of information, it’s time for the next step in the process: taking action. Knowing yourself and your information processing preferences can help you create an organization system that works best for you. Obviously, we can’t cover every possible solution, but these suggestions will hopefully get you headed in the right direction. Scheduling programs like Google Calendar might work well for you so that you can input and then see all of your appointments on your agenda. In your closet, you’ll want to have a lot of space and only the current season’s clothing on hangers. A hook on the back of a door can be good for displaying your next day’s outfit. You might also benefit from having your folded clothes on a shelf instead of hidden in a dresser drawer. Try your best to have an office with a door. You’re likely to go batty in cubicle land — especially in cubicle land with only waist-high walls. Carry a small digital camera or a cell phone with a camera in it with you at all times so that you can take images of things you need to remember. You may want to use Evernote to process this information. 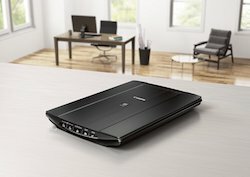 Consider setting timers or audio reminders on your computer to help alert you of meetings and other scheduled events. Carry a small recording device with you so that when you have an idea you can record a message to yourself. Most smartphones also have this ability. If you need to share an office, try to get an office with someone who works while wearing earphones. When you talk to yourself, he or she won’t be distracted when you need to talk through ideas. Keep all of your files in alphabetical order to help you find them more quickly. Have a headset for your telephone since you interact more reliably with people over the phone than you do by email. Feel comfortable pushing your office furniture against the walls so that you have space to move when you need to. Explore non-traditional desks when looking for office furniture. A drafting table or adjustable height table might work better for you than something that has a fixed height and angle. Keep a space for a small fan on your desk and a space heater under your desk. Exercise before going to work in the morning. Have as few objects on your desk as possible so that you’re not tempted to pick them up when you need to concentrate. However, you should also have a stress ball quickly available to squeeze when mulling over ideas or talking on the phone. You probably like to try on different outfits before choosing the best one to wear, so be diligent about returning the non-selected items back to their proper home. What organization tips and tricks do you employ in your home and office that are crafted toward you information processing style? Please share your insights in the comments! When you read a book or newspaper article, do you instantly commit it to memory? Or, are you someone who likes to pace the floor when you’re thinking? Maybe you are someone who can hear a lecture and have no need to take a single note? How you process information has a strong correlation to how you may want to organize your home and office. Strategies that work well for an audible processor might fall flat on someone who prefers to intake information visually. Knowing yourself and your preferences can make a difference in how successful you are at creating an organization system. The two posts in our “understanding how you process information to help you get organized” series will hopefully aid you in creating your profile. Directions: Add one point to your score for each statement that strongly applies to you. The category with the most points is your dominant processing style. You may have strengths in more than one category. I can remember that I need to do something if I write it down. I need to visualize myself wearing something to make a decision about what I want to wear. I need to look at a person when they’re speaking. It has to be quiet for me to be able to complete my work. Seeing data displayed in a graph is vital to me understanding numerical information. I am horrible at remembering jokes. I can remember phone numbers if I can visualize typing them on a phone’s key pad. I prefer to listen to books on tape or to read books aloud. The more I discuss a problem with my co-workers, the easier it is for me to find its solution. In school, I only needed to attend class lectures to perform fine on the tests. I remember what people have said before I remember who said it. I like to complete one task before starting a new one. A train could be passing through my living room and I would still be able to hold a good conversation with my Aunt Sally on the phone. When I take on a project, I want to start doing instead of planning. When I need to take a break from working, I have to get up and move around my office. I can work effectively in a coffee shop or in an airport waiting area — I don’t need to be at my desk to do work. I can remember a client’s name better if I shake her hand. I would like to ride my bike to work, if I don’t already. I think more clearly throughout the day if I exercise before work. I am often aware of the temperature in my office. When I pick up something as ordinary as my stapler, my mind drifts to memories somehow associated with a stapler. Which category best represented your processing style? I am visual processor with a relatively high score also in kinesthetic. The second post in the series will provide suggestions for how you can take this information you have learned about yourself and apply it to your organization systems. Stay tuned! I’m Canadian and have spent most of my life living in Canada. When you visit a Canadian’s home, you’ll be expected to remove your outer footwear at the door unless you are specifically told not to. This is not unique to Canada. Many cultures have a tradition of removing outside shoes at the door. Soles of shoes are a potential vector for pathogen transmission and removing them keeps the inside of your home cleaner. It was very surprising to me, living in other countries, to find that people do not take off their shoes at the door. I guess this is why the Clean Step shoe wrapping machine was invented. 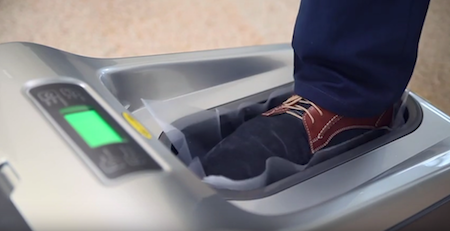 It shrink-wraps the soles of your shoes in one-time use, non-biodegradable plastic to keep the floors clean while walking around your home or office. Maybe in the parts of the world where the climate is mostly dry the shoe wrapping machine would work. I doubt the plastic would stick over a layer of ice and snow or mud and slush typical in many climates. Maybe you’re thinking this would be useful in an area that required a high level of hygiene. Probably not. In the food and pharmaceutical industries, only super-clean indoor shoes are worn. When going into the production area, workers are required to walk through a shoe sanitation station that further cleans and reduces the germ load on the shoes. In hospital and other medical settings, there are several types of automatic shoe cover dispensers that cover almost the entire shoe to prevent germ transfer. The Clean Step shoe wrapping machine only covers the sole. Maybe you’re thinking this would be useful if you already had your boots on but forgot an item in another part of the home. Not really. We prefer to use babouche — felt indoor overshoes. They slip on and off easily over any size boot. They are re-usable and washable. They take up much less space than the shoe wrapping machine and do not require electricity to use. Even contractors that come to your home to repair something will often bring their own set of babouche to wear indoors. Avoid the shoe wrapping unitasker and just take your shoes off. Could you expand the article to address studio apartments? What would be the best way to isolate a workspace from the living space? I guess I could use a divider like you show in the first article to isolate the bed/sleeping space from the rest of the apartment. Thanks for your question Eric. We would be happy to expand on our answer. There are several ways other than a folding room divider to section off different areas of the apartment. The first one we suggest is a curtain divider. Curtains are great because they can be closed for privacy and opened to make the space larger. They are washable and generally easy to install. There are many styles and colours available. Tension rods are ideal if you have brick or plaster walls because you do not have to use a drill or screws for installation. They work best in smaller openings with lighter weight curtains. Also, if you have cats or small children who might pull on, or attempt to climb the curtains, the rod may fall down. If you are sectioning off a bedroom, I suggest that you use room darkening curtains to improve sleep quality. If you do not have walls on which to mount a tension rod, then you might consider the ceiling track system. There are 90º and 45º corners available so you can make more than one wall out of curtains if required. You have to bolt/screw the track into the ceiling and that might be difficult if you are a renter or there is any trace of asbestos in the ceiling. Some people use bookshelves to separate spaces in a studio apartment. I do not recommend this unless the shelving units are anchored into the ceilings and floors. IKEA’s Elvarli system bolts into floors and ceilings. With various configurations available it will allow you to divide your living space and create extra storage. Another option to hide a workspace in a studio apartment, is to use an armoire or cabinet. There are various styles available depending on your needs. Some companies who design kitchen cabinets may also be able to design one to your specifications. 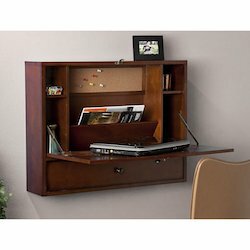 If you are looking for simply a computer workstation, a folding wall-mounted desk is a space-saving option. When living in a studio, loft, or other open-concept designed home, always look for furniture that can do double-duty such as hidden filing cabinets and storage ottomans. Thanks for your great question Eric. We hope that this post gives you the information you’re looking for. In her book The Simple Living Guide, Janet Luhrs suggests that people wash their dishes by hand. I like Janet Luhrs and agree with most things that she says, but when I read this piece of advice I laughed aloud. I grew up in a house without a mechanical dishwasher, and my daily chore was to wash the dishes by hand. Every night, for more than 10 years, as I stood with my hands immersed in soapy water, I dreamed of owning a dishwasher. I pledged that in my adulthood I would never wash my dishes by hand. In the present, if I didn’t have a dishwasher, I cannot imagine how disorganized and dirty my kitchen would be. One of the things about committing to a dishwasher lifestyle, though, is that it limits what I can buy for my kitchen. The everyday plates and cups are almost always dishwasher safe, but many items beyond the basics typically are not recommended for the dishwasher. Stemless stemware. These wine glasses and champagne flutes have no stems so they easily fit in the top drawer of a dishwasher. They also save space in the cupboard. All-Clad Stainless Cookware. The all-stainless version of this cookware is the only type that can go into the dishwasher. I registered for this when I got married and a kind family member bought it for me. It has held up wonderfully with constant dishwashing. White Bone China. Surprisingly, plain-white china can be safely cleaned in the dishwasher. It’s durable and can easily be dressed up or down. I use my set all the time, and pair it with colorful chargers when entertaining. There’s no need to have two sets of dishes with one set as convenient and versatile as these. Unfortunately, I do not have a knife set to recommend. I currently have a Henckels set and put the knives in the dishwasher against the suggestion of the manufacturer. I have been throwing them into the dishwasher for more than five years and the handles haven’t split. However, I expect to need to replace them earlier than they would have needed to be had I been washing them by hand all these years. If someone has a suggestion for a dishwasher-friendly knife set, please feel welcome to leave it in the comments. I’ve read the packaging on many stainless handle knives and found that they also suggest being washed by hand (Kitchen Aid, Ginsu, etc.). In the original “Saying farewell to a hobby” post, I talked about how to decide if you’re not really into your hobby. Letting go of a no-longer-active hobby can be difficult, especially if part of your identity is wrapped up in that activity. (I know I still think of myself as a tennis player even though I haven’t touched a tennis racket in more than 10 years because of a rotator cuff injury.) But, if you make the hard decision to break up with the stuff for a hobby you’re no longer doing, getting rid of the supplies can be emotionally difficult. Call up local enthusiasts whom you know are still into the hobby and let them take what they want from your house. They are more likely to use the materials than you are, and they will truly appreciate your generosity. Plus, as you pass along your supplies you can tell them stories and talk about how and when you acquired or used the items. You’ll get another happy moment sharing the history with your friends. Sell the supplies on a website whose community is dedicated to the hobby. For instance, if you’re a knitter or crocheter looking to de-stash your yarn, the website Ravelry has a marketplace forum that is perfect for you. Be sure to include shipping costs in the price of your goods, though, so that you don’t go broke getting rid of your items. Have a yard sale, but be very specific in your advertising to point out what types of things you are selling. “Woodworking Supplies Yard Sale” “Sailing Supplies Yard Sale” If you place an advertisement for your sale, use similar language and target publications people interested in these hobbies would read. Often stores that sell new supplies for a hobby also will sell “gently used” items on consignment. Call your local stores and ask about their policies. If they won’t sell them, usually they know who will or clubs related to the activity that could use the supplies. Programs and/or schools that teach the hobby — rock climbing schools, your local YMCA or community center, the high school down the street, a day care center (for adults or children) or seniors’ center — typically need supplies to help teach others about the activity. Make a few phone calls and you’ll probably find a program that is elated to take the discount or free supplies off your hands. Sites like eBay, Craigslist, and Freecycle are great for getting rid of items, but I’ve found that it’s harder for me to use these sites for hobby supplies that I have some sort of bizarre sentimental attachment to. Even though I’m no longer using the stuff, I still want to know that it’s going to someone who is enthusiastically going to use it. This is probably true for whomever buys or picks up the item from one of these three websites, but my mind doesn’t process it that way. Weird, right? Good luck with the final step in purging your no-longer-active hobby supplies. And, most of all, enjoy the space for whatever new will take — or not take — its place. Do you consider yourself a tennis player, but the last time you touched your racket was 25 years ago? Do you like the idea of being a scrapbooker but have never made a complete scrapbook? Are you keeping canvases for masterpieces you may one day paint, yet all of your paints are dried and your brushes deteriorating? Is your guitar missing strings and in a case at the back of a closet? Do you have areas of your home set aside or filled with stuff related to a hobby that you spend less than 10 hours on a year? If you answered yes to any of the questions above, you are just not that into your hobby. It can be difficult to admit, but if you’re not averaging at least an hour a month pursuing a hobby, it’s time to let it go. The space you’re sacrificing in your home is too valuable to store things you don’t use. If you don’t have storage issues, it’s still worthwhile to get rid of your unused hobby stuff. Every time you walk past it I bet you think, “I wish I had more time to do X.” You don’t need that stress and guilt. If it were really important to you, you would pursue it. Identify all of your hobbies and all of the things associated with them in your home, garage, and office. You may benefit by collecting these items and laying them all out in your front yard or an open space in your home to see how much space you’re sacrificing. List all of these hobbies and then estimate how much time you’ve spent pursuing each of them in the last 12 months. Be honest with yourself. Any hobby with an estimation of 24 hours or less should be carefully reviewed. If you went camping one day last year, you would reach the 24-hour mark for camping as a hobby. However, is one day of camping worth all of the space used to store your tent, sleeping bag, and all other accoutrements? On the flip side, if you spent one Friday night a month last year playing Bridge with friends and averaged about two hours of playing time a sitting, it’s probably worthwhile to hold onto a deck of cards. Any hobby with an estimation of more than 24 hours also should be considered for review. You may realize that you’re spending so much time and space on your hobby that you’re neglecting things more important in your life, like time with your spouse or children. It’s okay to break up with these hobbies, too. In most cases, however, you probably have a healthy relationship with your active hobbies and you’ll decide to keep up with them. You still will want to evaluate how much stuff you have for them. If you have more supplies than you could use in a lifetime associated with that hobby, it’s time to weed through the collection of stuff. My rule of thumb is that you should never have more than one year’s worth of supplies for an intense hobby — and less than that if you can manage. There is a caveat to my assumption that you’re just not that into your hobby that I feel I should mention as a footnote. The truth may be that you really like your hobby, but somewhere along the way you misappropriated your time and let it fall by the wayside. Instead of making chairs in your woodworking studio, you’ve been watching television. If this is the case, make new priorities and recommit to your hobby. Turn off the t.v. and head to your studio. Decide to re-evaluate that hobby in six months. If in six months, however, you’re still watching t.v., then it’s time to admit that watching t.v. is your hobby not woodworking.